Tropical style– When the good weather approaches, we want to dress differently. We like to use more vivid colors and fun prints in our clothes. Because we like to mix and melt in the warm and tropical atmosphere of the summer eras. In decoration we do the same. But we dare to change our spaces less frequently. However, there are many ways to redecorate our bathroom; ways that can be both economic and creative. And an example of this is the tropical style. The tropical style is a type of decoration that fuses the retro or vintage style with the most exotic motifs. Or decorations, obtaining a new way of decorating the bathroom that can give a lot of life to the decoration of the home. It is one of the best options for those nature lovers who want to mix their daily life with the natural and traditional aspects in the decoration. And capture this idea in the bathroom with the humid environment of it, it is a great option. For its part, we can say that this style mixes the basic aspects of the retro style, which is composed by the incorporation of elements. Or objects typical of the period between the 30s and 60s. To this vintage look, the style is added tropical. Adding elements of the most exotic nature and achieving that the bathroom can provide us with a sense of tranquility, harmony and inspiration. What details do we need to have a tropical bath? Color palette. 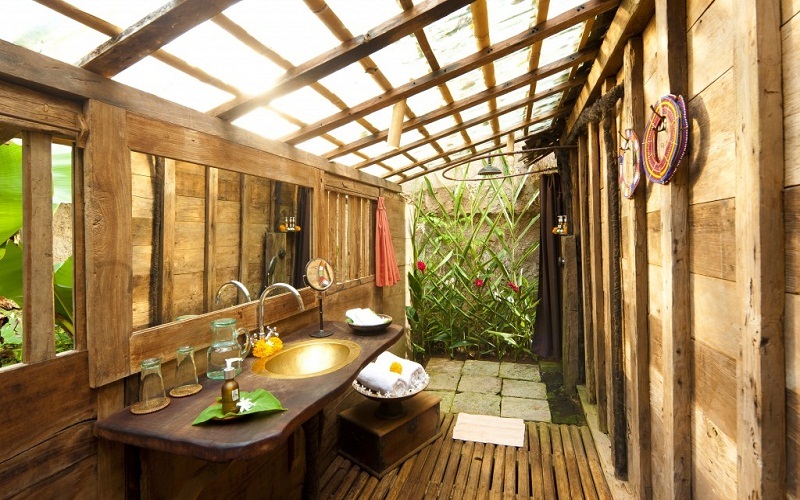 To decorate our bathroom using this trend, we must bear in mind that there are different ways: For tropical designs. It is common to use bright colors or earth colors. However, we can obtain tropical details by using paler colors: sky blue, sage green and sand. Natural elements. It is essential to use natural elements : stamped paper simulating nature, hanging plants, soil pots, vines, blinds or bamboo dividers, shower curtains with tropical decor, jute carpets, tree branches, sea shells. With this, we get a environment close to the natural world, providing each of your days with an extra vitality . The lighting that should be used in these environments is abundant, and if possible, natural light. Or that simulates these effects. If neutral colors predominate in our bathroom, we can use accessories, such as towels, paintings or other decorative touches with earth colors that stand out and show a bit the character of this bathroom. To achieve a tropical finish. We will choose retro or antique furniture with touches of copper. Or aged brass, in order to mix both styles. The bathroom accessories ideal for this type of space should be elements that mix in the tropical style environment in an ideal way. For this, we highlight the Juncal collection. It is a range of accessories for the bathroom that is available in various finishes: chrome, chrome-white, chrome-gold. And aged brass. For this style, we recommend using elements such as towel racks, wall dispensers or soap holders in aged brass. As it highlights the green tones of tropical vegetation and contributes to highlighting the vintage look of the bathroom. It’s like everything; there are different types of bathtubs depending on the material. Its features or design. We found from angular bathtubs to relaxing whirlpool tubs. Then you can see images of bathtubs, one more beautiful than the other. The angular bathtubs are a real beauty. Visually convince. They create a relaxing space in which to rest after a long day of work. Who would not submerge in one of these beautiful corner baths? In addition. It is necessary to emphasize that they take advantage of the space better. Because when placed in the corners, it allows having more free wall to place cabinets or simply to give more sensation of amplitude. That is why they are ideal for small bathrooms, although it must be said that they are also used in large bathrooms, for their aesthetic value. Far from the rectangular bathtubs, which are the most commonly seen, they are an interesting option in larger bathrooms. They belong to the type of free-standing bathtubs. And can be placed far from the walls. For example, in the center of a large bathroom. However, if your space is small. You can also place it a little closer to the wall, the visual impact will not be the same. But it will not be bad either. The truth is that this type of bathtubs with curved lines is ideal for modern bathrooms. These bathtubs with legs are reminiscent of the first models of bathtubs. As in the previous case, these are made to show off. Place them in the center of the bathroom or in the most illuminated area of ​​the bathroom. The legs, in addition to holding the structure, fulfill a decorative function, as they are visible. The free-standing bathtubs will give your bathroom a classic and retro air that will turn it into a most noble place. They are achieved in all these ways mentioned above. Yes, whirlpool baths can be rectangular, oval or angular. The grace of these is not precisely in the design, rather it is in your whirlpool system, which will make you relax with your air jets in a bubbling bath. Keep in mind that these tubs require special maintenance, especially if your city has high concentrations of lime in your city. It should be noted that, generally, they are more expensive, as they enter the segment of luxury tubs. 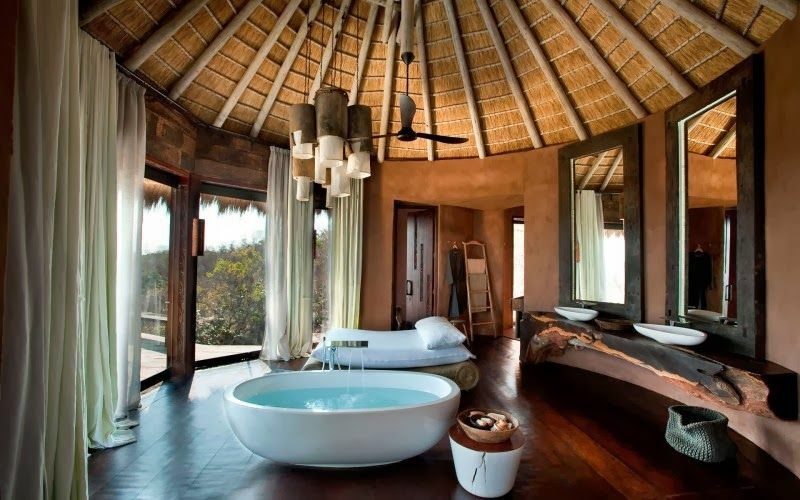 And if you like luxury maybe you are interested to see these 10 bathrooms with incredible views. Where we can also see different types of bathtubs that will surely make you dream. Of course, to install one, you have to think about entering into works. They are achieved by raising the floor with a platform or deck and fitting the bathtub. You can access them by stairs, something that confers, without a doubt, a special charm. 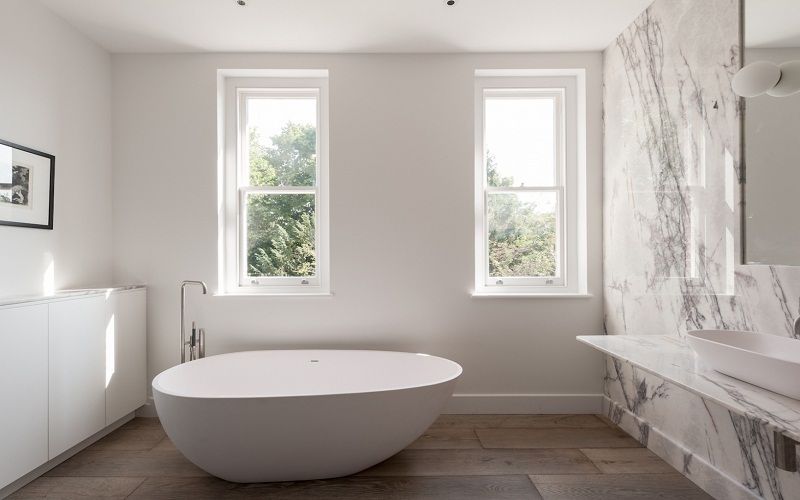 We love these types of bathtubs, although as in other cases, they are only suitable for houses with more space.